This year Sweden’s Evergrey are celebrating their twentieth year as a band. Having compiled an impressive catalog over the course of their career, their legacy clearly speaks for itself. 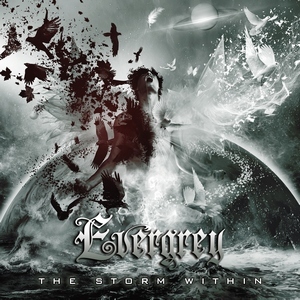 The Storm Within is Evergrey’s tenth full length album and finds them continuing their outstanding track record of releasing breathtaking material. Building on the strength of their incredible 2014 release Hymns Of The Broken, Evergrey continue to develop their sound by blending heavy progressive riffs with accessible memorable vocal melodies. Guitarist/vocalist Tom Englund possesses an emotional endearing voice that propels the material and separates Evergrey from their peers. Evergrey continue on the path they paved with Monday Morning Apocalypse. The concentration is placed more on the vocal melodies and songwriting, which makes the material easily digestible. Where the early material was steeped with progressive elements and the music was more complex, there are still elements of that within their songs. Opener “Distance” is built around dynamics and a chugger of a riff. A down picked down tuned guitar fills the verses before a gorgeous emotional chorus soars and takes the listener away to new heights. A choir and a string arrangement accompany Englund as the chorus will be embedded into your head. “In Orbit” is another melodic success that features Nightwish vocalist Floor Jansen duetting with Englund. A surefire single, the two play off of each other brilliantly as Jansen’s voice is incredibly tender and collides exquisitely with Englund’s larger than life melodies. “Passing Through” is another Evergrey classic that is bass and keyboard driven which gives Englund’s voice room to breathe and soar. Another highlight is the stunning “My Allied Ocean,” which will have old Evergrey fans roaring with approval. Guitarist Henrik Danhage and Englund both expertly blaze through solos in unbelievable fashion. The chorus is another stunner that ups the tempo and finds them turning up the heaviness factor. Evergrey continue the partnership with Englund’s wife Carina on the gorgeous “The Paradox of the Flame.” An emotional landscape of melodies will engulf your soul and leave you breathless as the two trade back and forth in this tale of lost love and sorrow. The title track ends the release on another emotional rollercoaster. Staccato riffs complement powerful orchestration that serves as the perfect backdrop for Englund’s finest performance. An incredibly expressive chorus is one of the best in the entire Evergrey catalog as the vocals tap into an emotion that moves me.